To the outside eye, Kang Nam Tofu House is simply a Korean restaurant tucked away in a California strip center. But diners are granted an experience unlike most when they learn that their server will be accompanied by a robot. Owned by John Ha, co-founder of tech startup Bear Robotics and former Google engineer, the restaurant is the first in the world to use the robot-turned-server’s assistant. Ha learned the tricks of the service industry trade by swapping out engineering shifts for ones as a cook, server and dishwasher before acquiring the joint himself. It wasn’t long before he realized that the implementation of artificial intelligence has the potential to enrich and improve the dining and serving experience. From there, Penny was born. 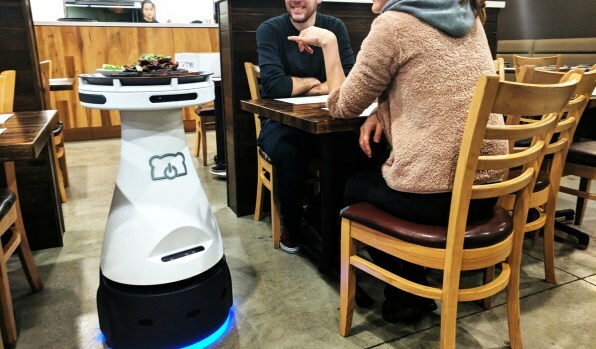 The small, pedestal-shaped robot is designed to navigate the restaurant’s crowded, narrow spaces using sensory technology to avoid any obstacles or roadblocks. In place of a food runner, Penny can be summoned by staff members via tablet, and is used as a loading dock for food before delivering plates and bills to customers. According to Ha, Penny’s role creates a more pleasant culinary experience for staff and patrons alike — resulting in everything from lower staff turnover, fatigue and injury, to higher tipping rates and customer satisfaction.